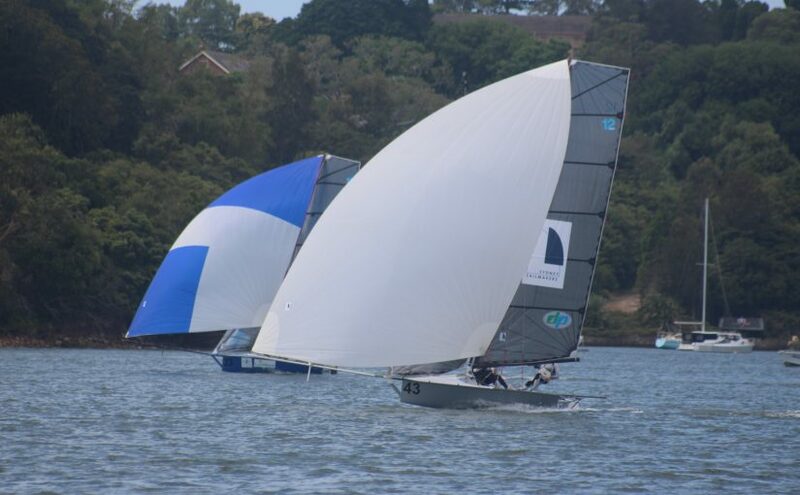 The short course Abbotsford Invitational is on the 7th February at Abbotsford Sailing Club. The Notice of Race can be downloaded here. This entry was posted in News and tagged Abbotsford on January 27, 2015 by Skiff-Ed. Forecast light Big rig, day showed stifling hot and completely airless – looked like a bad day. Then the wind readings at the airport showed a 20 knot aberration. 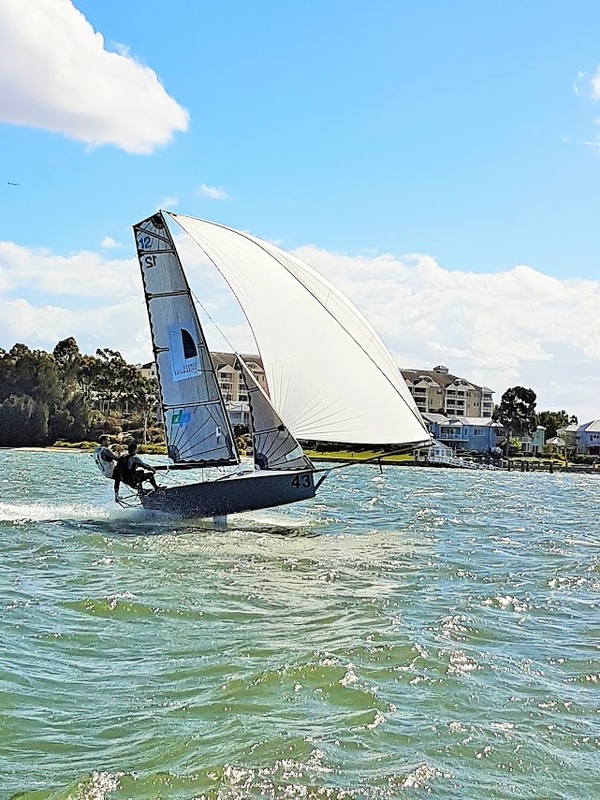 The wind blew into Abbotsford, still under 10 knots on the harbour, leaving the fleet with a conundrum: all chose to go 2nd rig as a compromise. 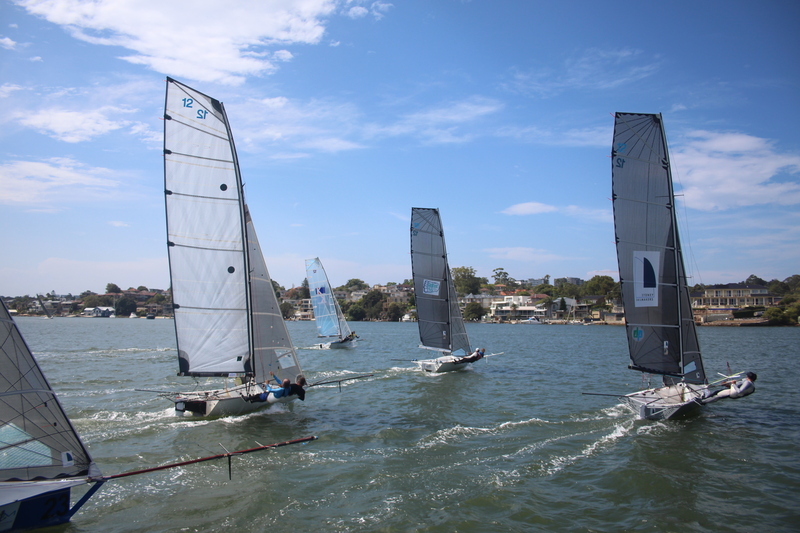 The fleet launched into the building breeze, about to be given a masterclass in skiff-racing by the 2 front-runners. Start in puffy South-easter in Bedlam Bay for a short work up under the Abbotsford scarp, with Sydney Sailmakers (Nick Press & Andrew Stevenson), Garde (Brett Hobson & Brad Phillips) and Gemmell Sails (Murray Press & Scott Lanham) just ahead of Lincoln Crowne and Company (Jonathon Temple & Richard Jones) and then Skol (Peter Polec & Jamie McCrudden). Tight-bunched for the run through the twist in the river, back past the club to the bottom mark at Putney Punt. Breeze clearly much fresher than anticipated, all the skiffs well over-powered with their 2nd rigs on. 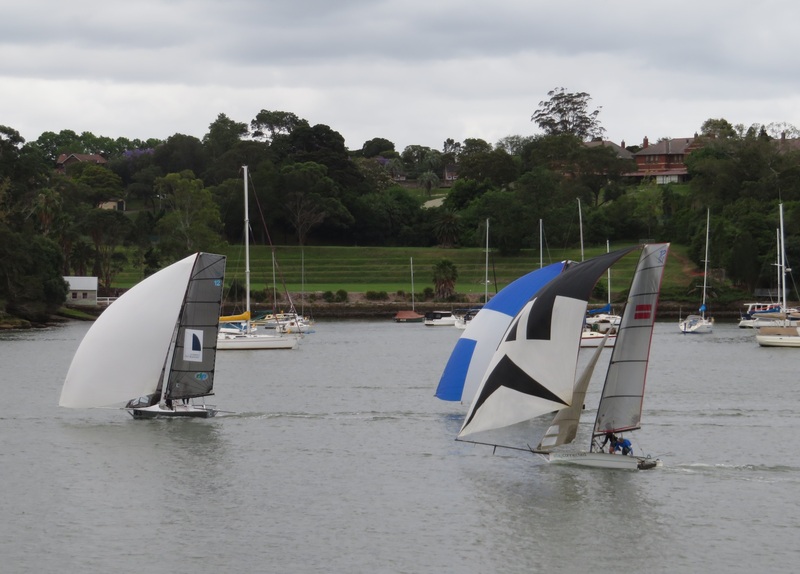 Garde lead around the bottom mark, then Sydney Sailmakers, with LCC 50m further back, Gemmell Sails having capsized toward the bottom of the run. 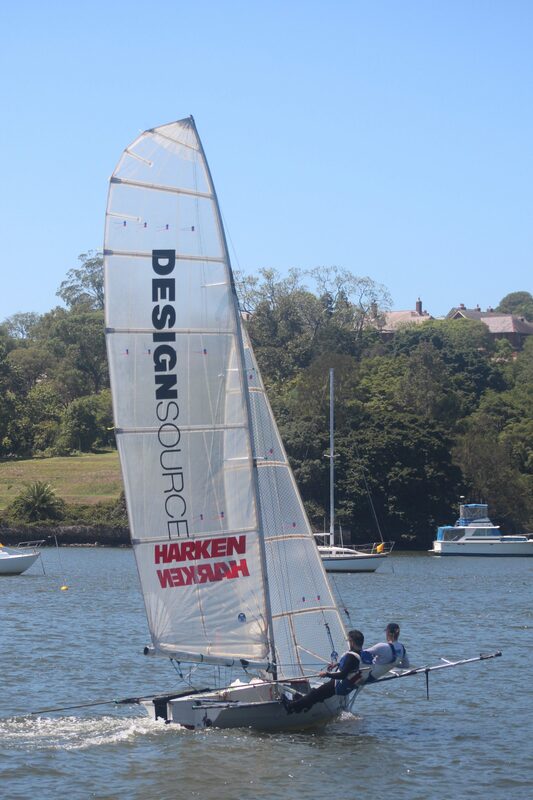 Garde and Sydney Sailmakers tussling all the way up the puffy, shifty work, extending on the following boats. Top mark the second time, for a by-now very fresh 2nd sail run to the bottom mark, still Garde in the lead, Sydney Sailmakers ahead of Lincoln Crowne and Company, then Skol. At the bottom mark, the lead two really cleared out on the fleet now, LCC capsized in the approach to the mark, allowing Skol through: Skol then capsized allowing LCC opportunity to catch, but Skol got going quicker. Last run down, to the last bottom mark in Glades Bay, still tight between Garde ahead and Sydney Sailmakers with daylight to the fleet, to finish in this order. Skol capsized in the approach to the bottom mark, followed into the tide by LCC: following their recovery, this was the order for 3rd and 4th places respectively. 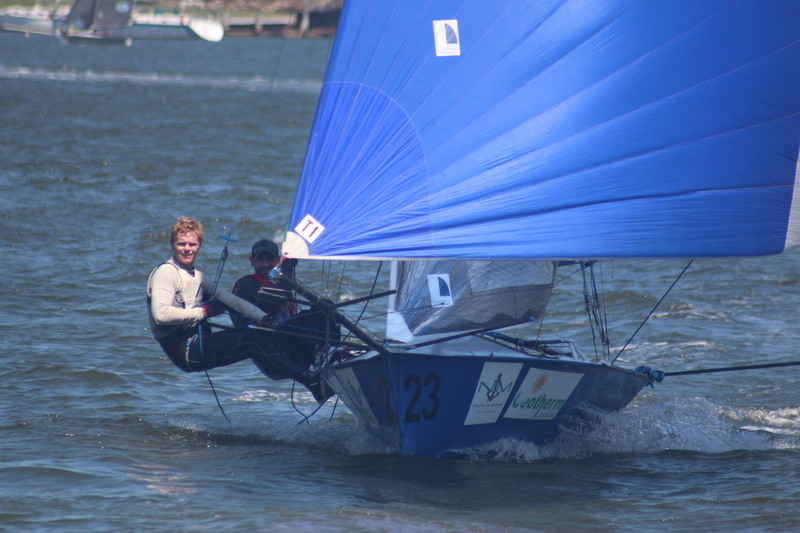 This entry was posted in News, Race Reports and tagged Abbotsford on October 28, 2014 by Skiff-Ed. 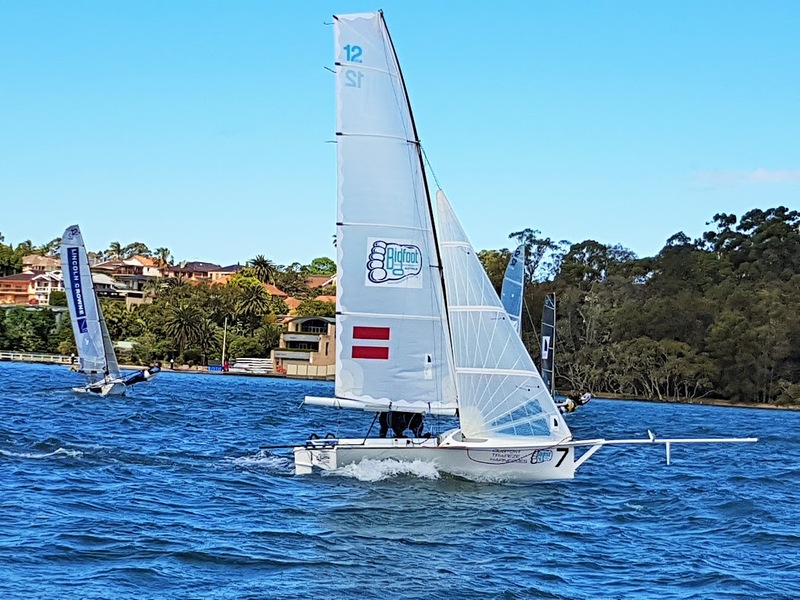 Jonathon Temple and Richard Jones sailing Lincoln Crowne convincingly won the Parramatta River championship at the weekend. The breeze forecast very sickly, pleasant surprise of big-rig Easterly when the punters arrived to rig-up. No question on the rig choice, except for Garde who chose to sail with a light-weight substitute crew in order to free-up regular crew to skipper for driver-less Vantage Real Estate. At the first tack The Bird came at Lincoln Crowne, who with right of way tacked them back: this caused The Bird to tangle with Garde, stopping the pair & allowing LCC & Skol to get away. This was the order up through the “esses” at Searles Monument, on the way to the top mark at the Gladesville Bridge. Puffs & shifts of pressure all the way up this work kept things challenging for the lead skiffs, with 100 metres separating the first 4. LCC around the top mark first for the spinnaker set up-river, followed by Garde, Skol & the Bird. 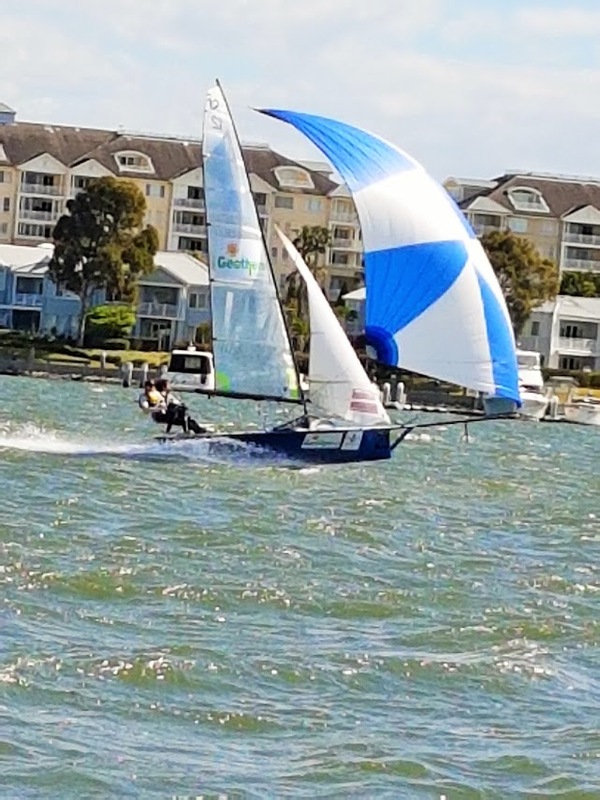 Just behind was www.skiff.org.au (Ben Faulkner & Renn Holland) who were going well. The lead bunch closed together in the variable breeze in the esses off the club, with LCC out of the doldrums just ahead of Skol. At the approach to the bottom mark LCC were not able to find the mark, dropping the spinnaker way early to look for it: this allowed Skol through to round the bottom mark first. Garde got a strong gust in the approach to the mark, carrying them deep and forcing a difficult spinnaker drop: this went awry when the spinnaker went around the back of the mainsail, requiring them to eventually capsize to clear it. 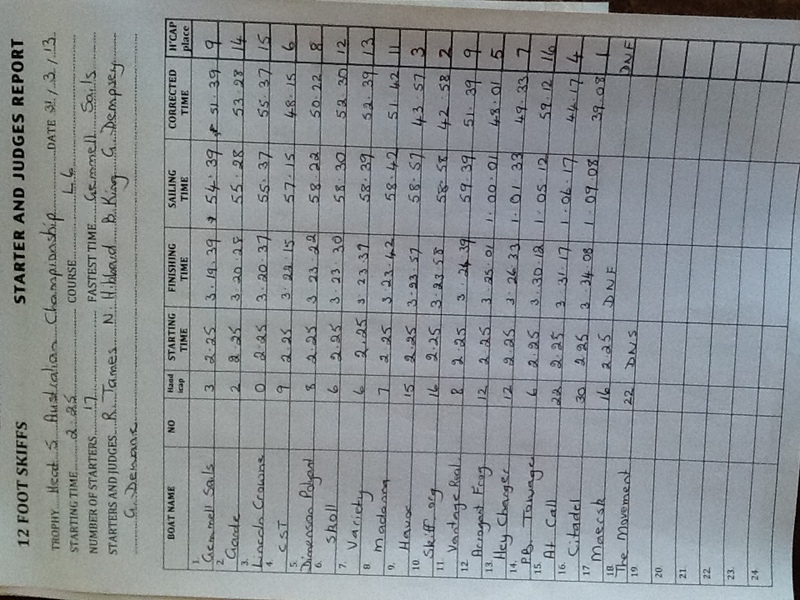 LCC passed Skol in the first part of the work, with The Bird also coming back at Skol, passing them on the second half of the work, then loosing 2nd again to Skol at the top mark for the second time. LCC cleared away on the second run, leaving Skol & the Bird to tussle on the run. The Bird called right of way in a close incident, forcing Skol to attempt a crash gybe, in which they nosedived, catapulting the crew up the rig & punching him through the mainsail some 2.5mts above the boom. This gave The Bird an easier task to concentrate on closing the gap on LCC, which was partially disabled by a broken jib block, preventing LCC sheeting the jib on one tack. 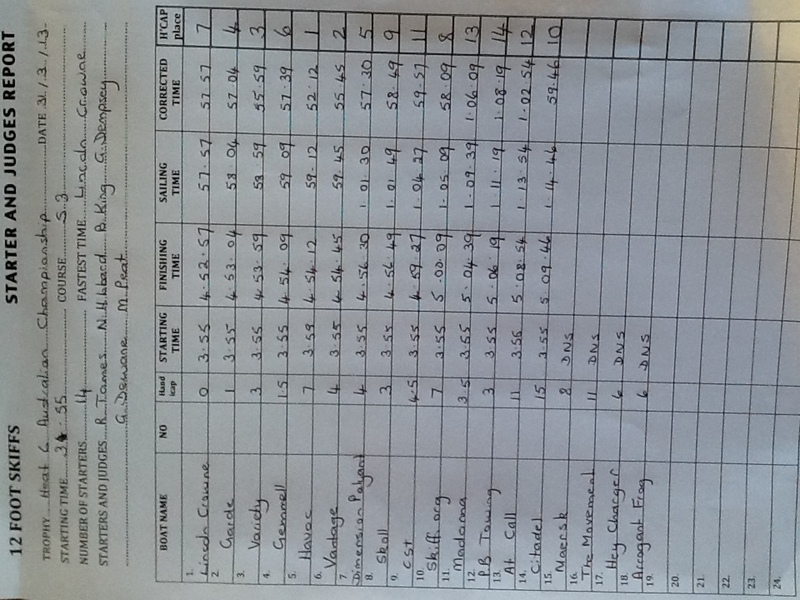 However the margin LCC had was sufficient to hold on for the win, by a minute, from The Bird. 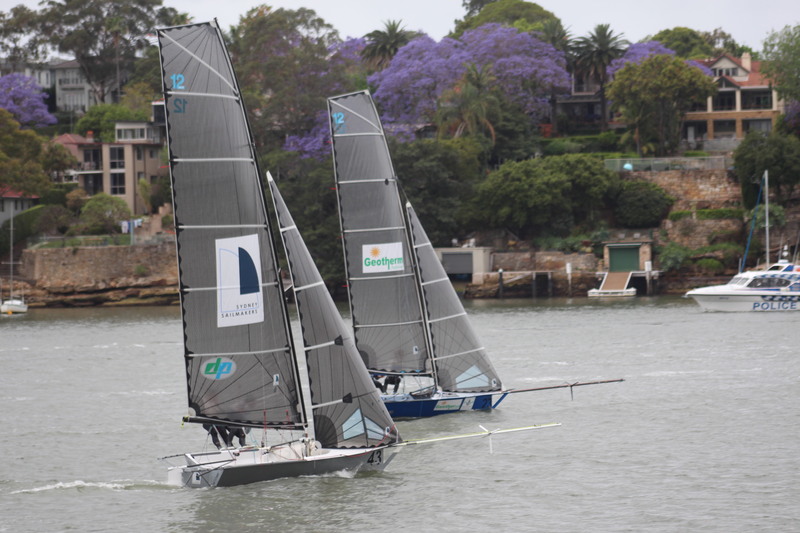 Garde had made gains on Vantage (Brett and Brad Phillips) and both skiffs now neck and neck with a righted Skoll, with half a lap to go, all fighting for 3rd place. 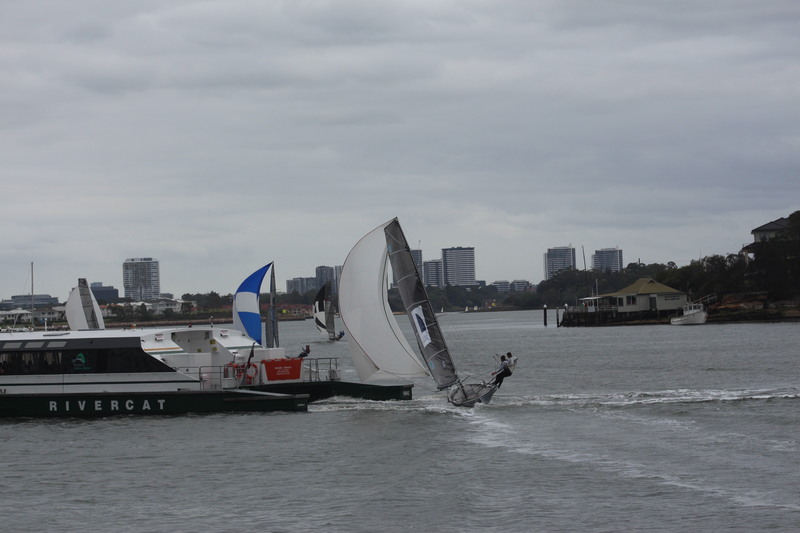 Vantage had a capsize 50m from the final mark, and Garde pulled into 3rd at the mark rounding. 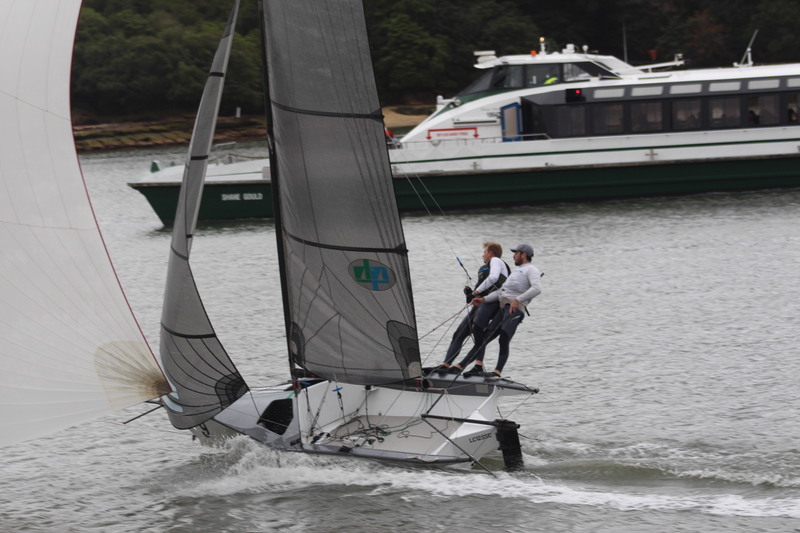 Skoll and vantage opted to sail high on the reach to the finish, Skoll rolling over the top of Garde, and Vantage making big gains. 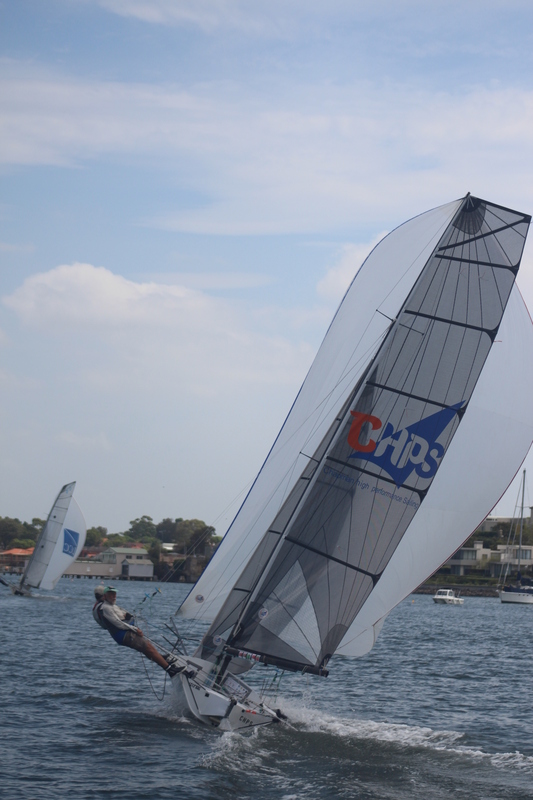 Skoll capitialised to take a clear 3rd, Garde just holding out the father/son pairing of Brad & Brett Phillips on Vantage to take 4th by a mere few seconds. 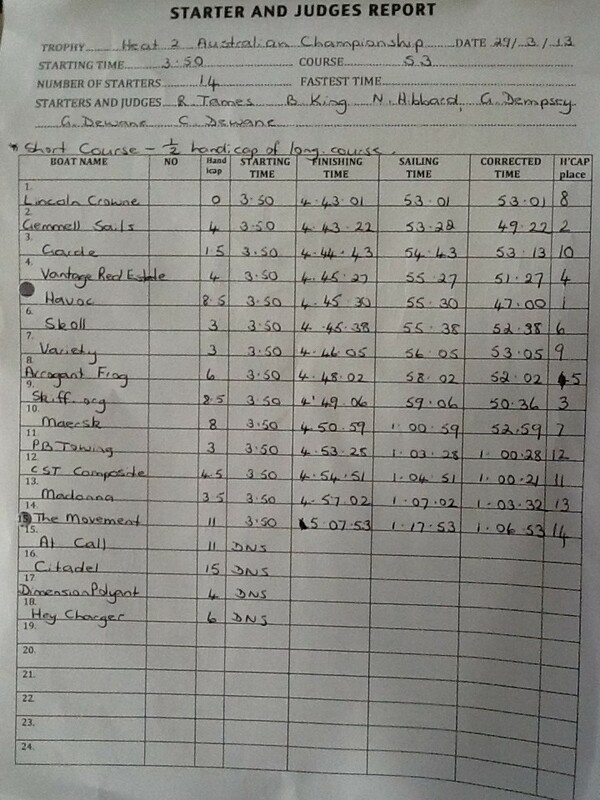 Handicap went to The Bird, with At Call second (John Williams & Will Lusty) then Vantage Real Estate 3rd. This entry was posted in News, Race Reports and tagged Abbotsford on October 29, 2013 by Skiff-Ed. This entry was posted in News and tagged Abbotsford on October 23, 2013 by Skiff-Ed. This entry was posted in News and tagged Abbotsford on March 31, 2013 by Skiff-Ed. 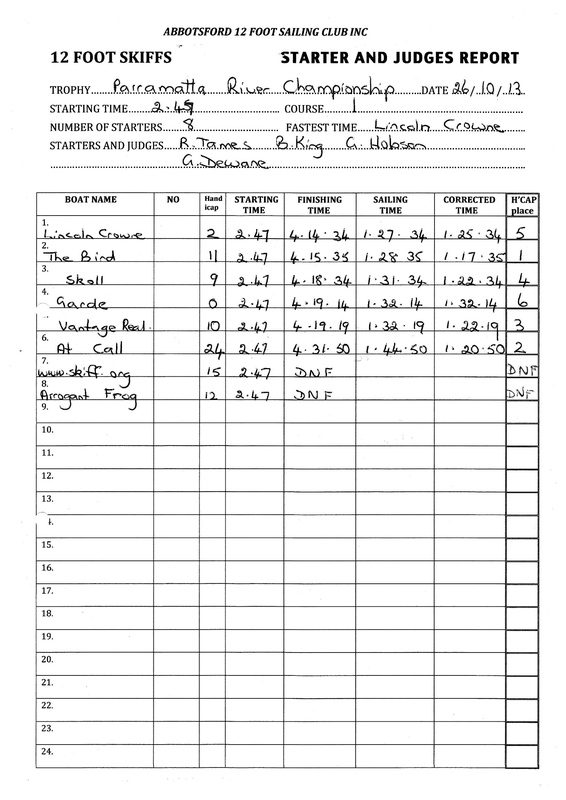 Lincoln Crowne continue to dominate the 2013 championships, winning both heats yesterdays (3 & 4). They recorded reasonably comfortable victories in both, but did not have it all their own way. 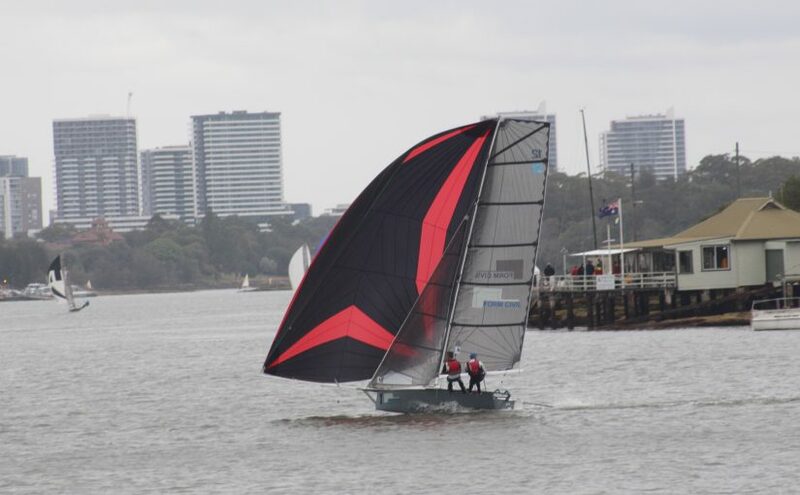 Garde pushed them right to the last work in heat 3, and both Garde and Gemmell continued to exchange leads with Lincoln in heat 4 before they final broke free down the last spinnaker run. Lincoln now hold a commanding lead on 4 points, with Garde on 10 and Gemmell on 12. 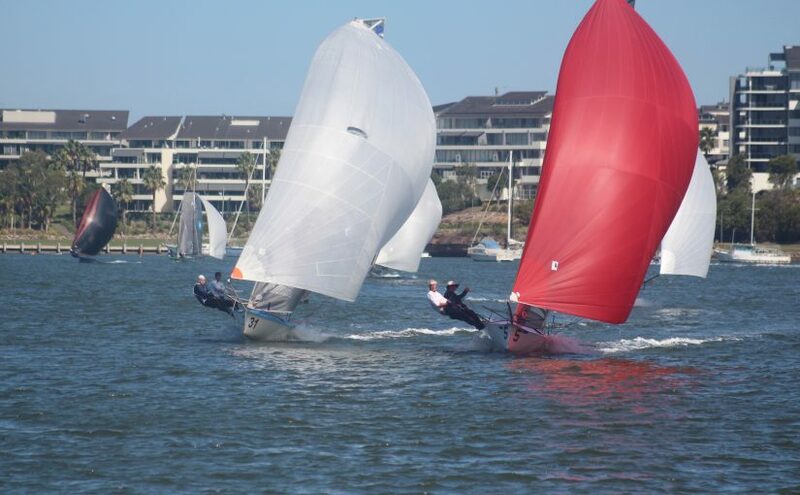 Vantage Real Estate continued their great regatta, picking up two 4th places, to sit comfortably in 4th overall. Havoc remains consistent, finishing 5th in heat 3. They have showed good speed at time throughout the regatta, and will continue to improve and begin pushing for a podium place very soon. 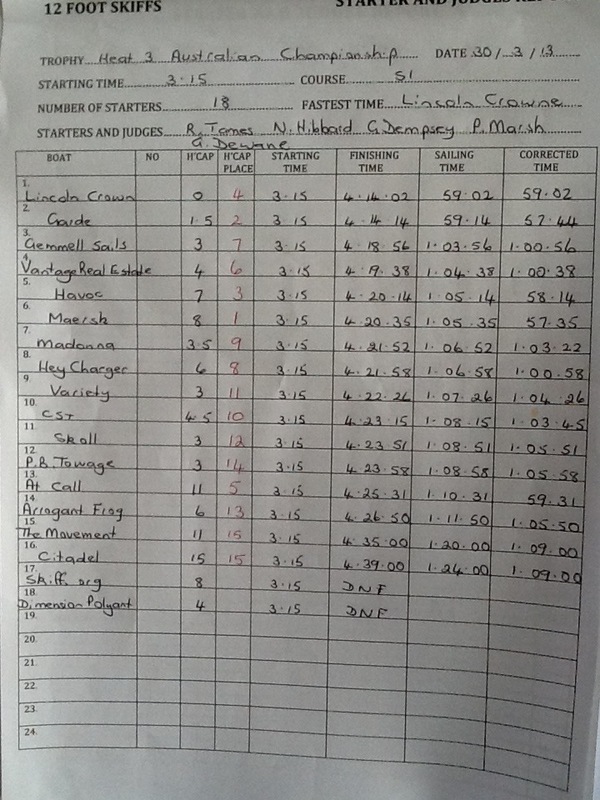 This entry was posted in News, Race Reports and tagged Abbotsford on March 31, 2013 by Skiff-Ed. 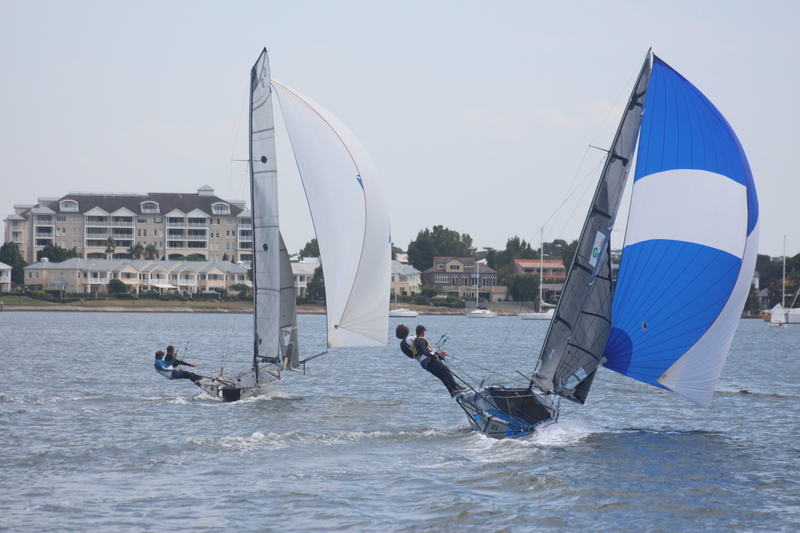 The 2013 Australian Championships are being held over the Easter long weekend by Abbotsford 12ft Sailing Club. Download the Notice of Race and the Entry Form (Entries due 22nd March). This entry was posted in News and tagged Abbotsford on February 28, 2013 by Karmen. 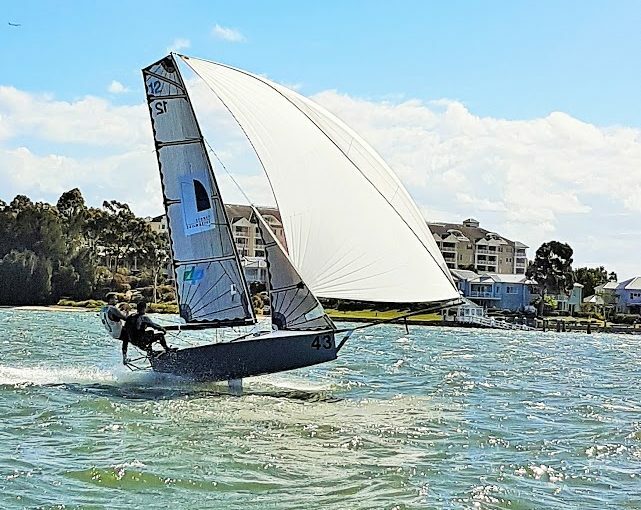 Garde (Brett Hobson & Brad Phillips) took out the State championships on Sunday, winning heat 5 and not needing to sail heat 6. 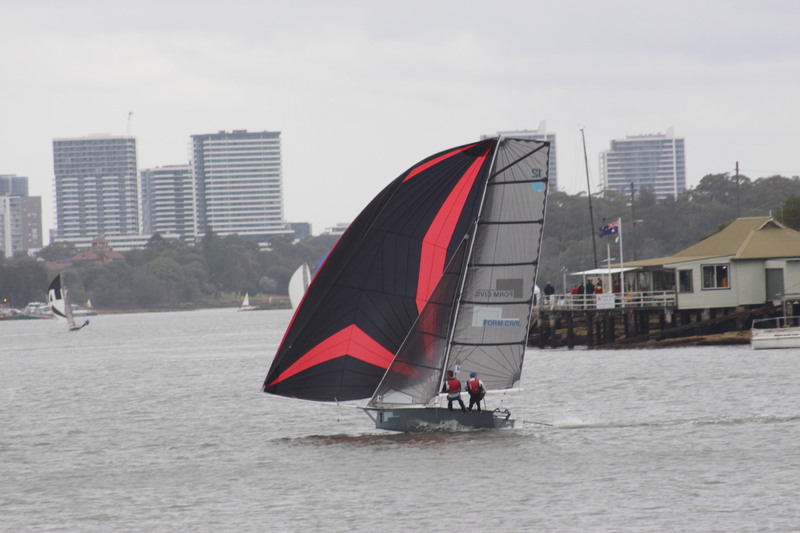 Heat 5 was delayed on shore for 40 minutes to let the 30-40knot southerly settle in. Garde lead up the first work and mark rounding, closely followed by Lincoln Crowne (Jono Temple & Richard Jones) and Gemmell Sails (Murray Press and Scott Lanham). 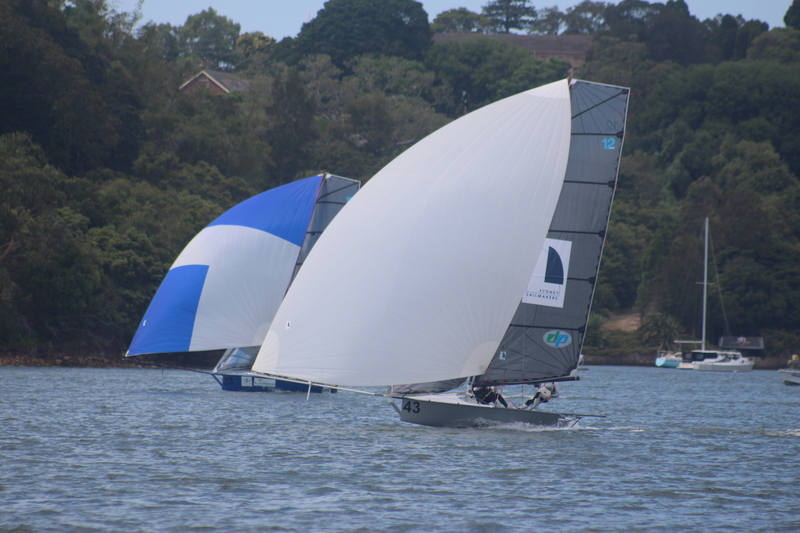 Both the latter skiffs came to grief on the downwind leg, allowing Garde to get away, and Geotherm to come through to second place. Arrogant Frog sailed a great race to finish 3rd, pressuring for 2nd place midway around the track. Lincoln Crowne chased hard on the last leg and gained on Arrogant Frog, but remained in 4th place. 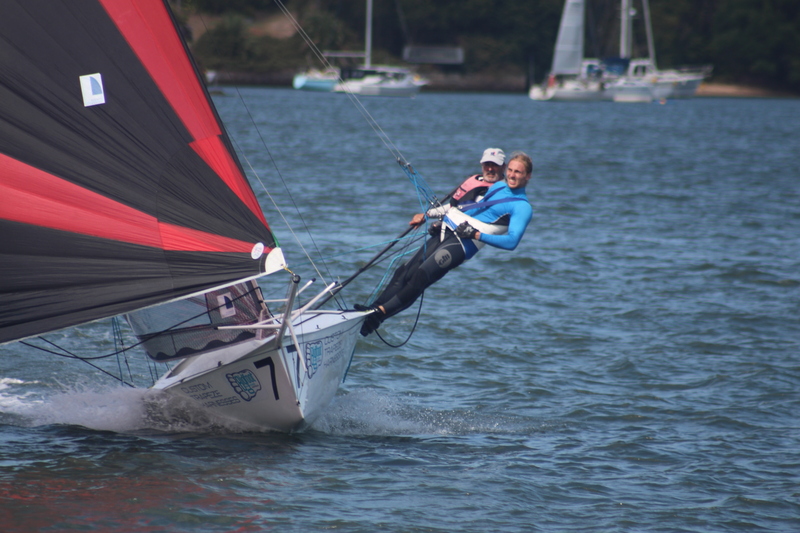 Gemmell Sails retired after breaking both tiller extensions and both crew members. 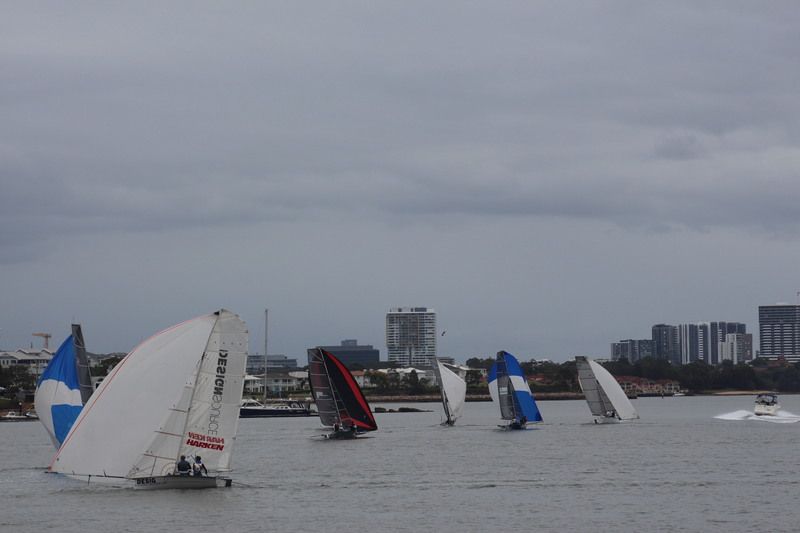 Only 5 boats made it to the start of heat 6, with the breeze kicking in again. Lincoln Crowne led the charge up the first work, from Gemmell Sail with stand in Skipper and Crew (Nick Press and Dan Phillips). 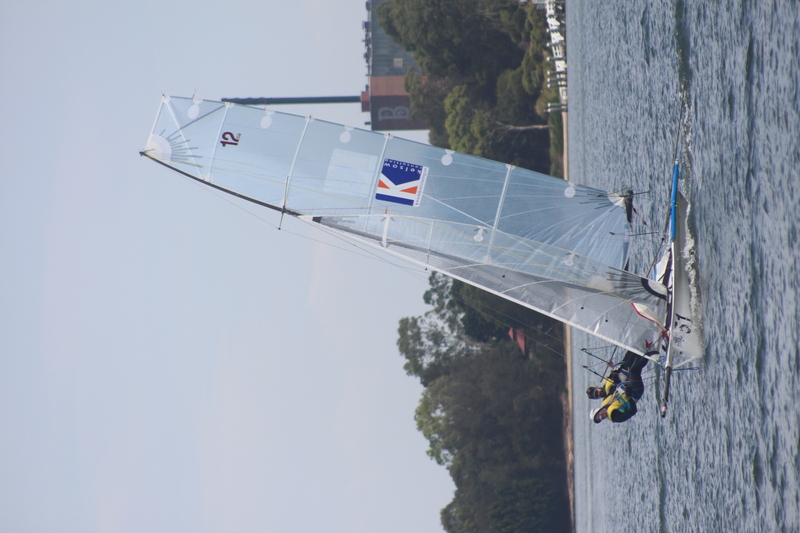 Most skiffs capsized once or twice on the work in the strong gusts. 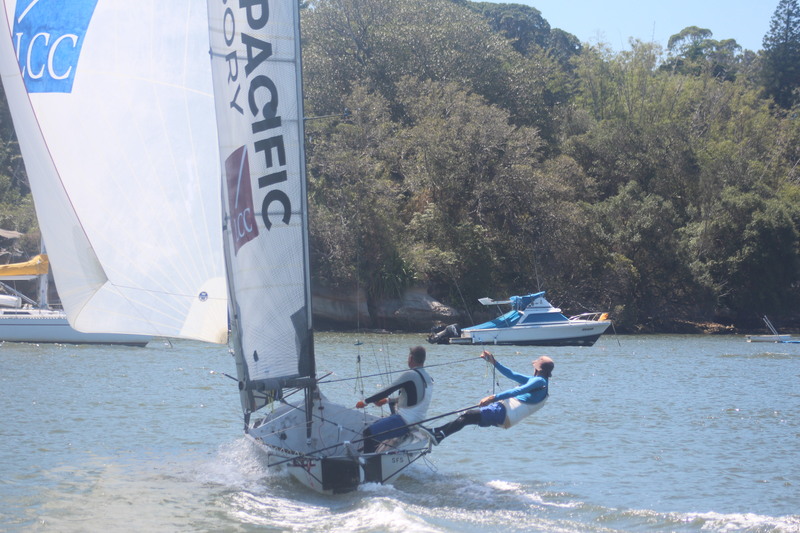 Variety (Adam Forbes and Richie Johns) were running in third place before coming unstuck on a jibe leading out of the bay. 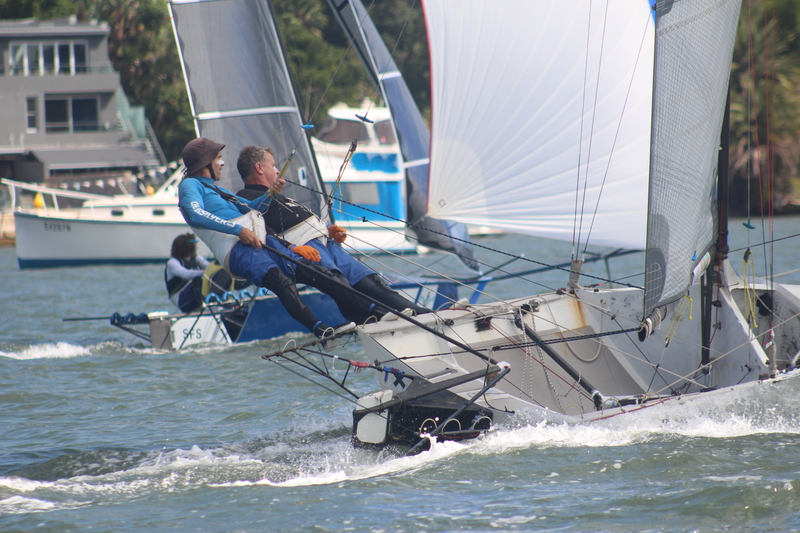 Geotherm and Hey Charger were both forced to down spinnakers to get around Cabaritta Marine and lost time on the leaders. The course was shortened at the next mark, with instructions to proceed to the finish. Gemmell Sails snuck thru Lincoln Crowne on the leg to the finish to steel the victory. 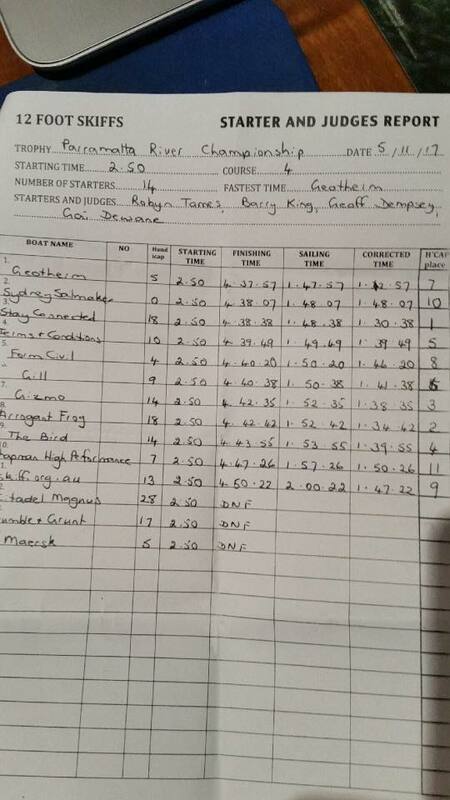 Geotherm picked up a third to cap off a great series (and won the handicap), Hey Charger 4th and Variety 5th. 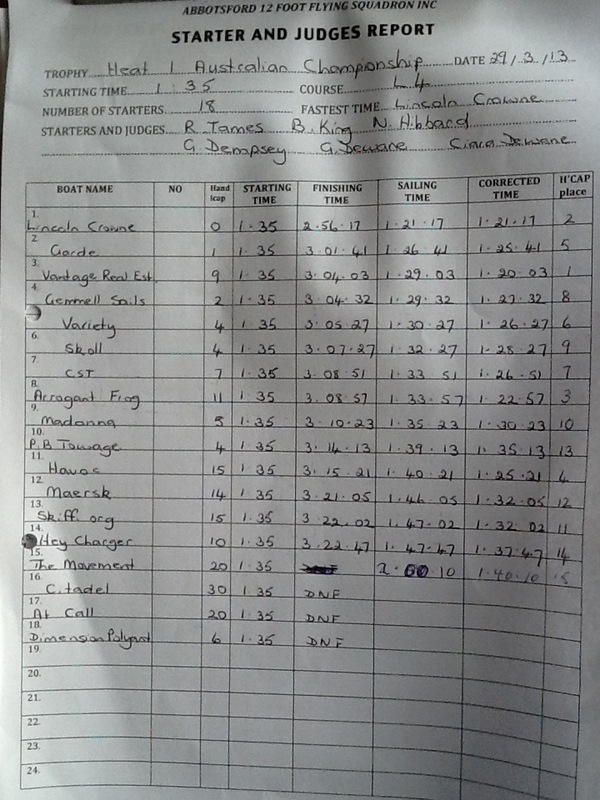 This entry was posted in Race Reports and tagged 2012 States, Abbotsford on December 9, 2012 by Karmen. 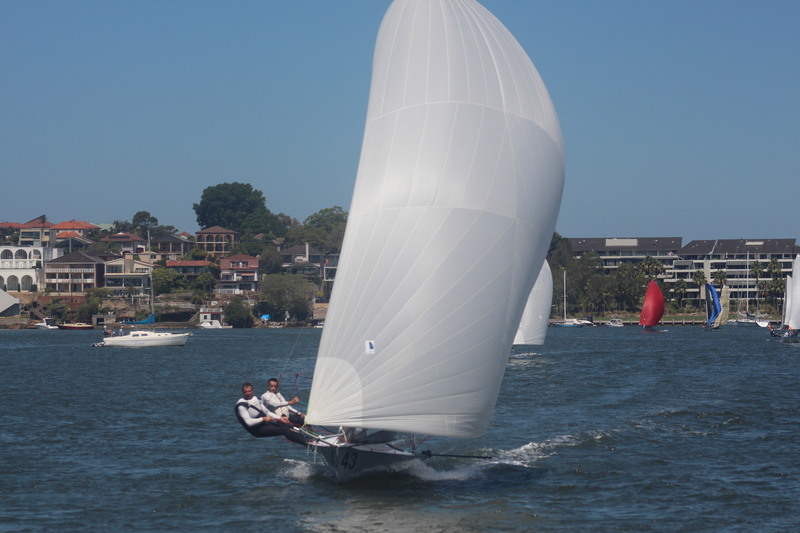 Lincoln Crowne sailed by Jonathon Temple and Richard Jones convincingly won the Parramatta Championship at the weekend. 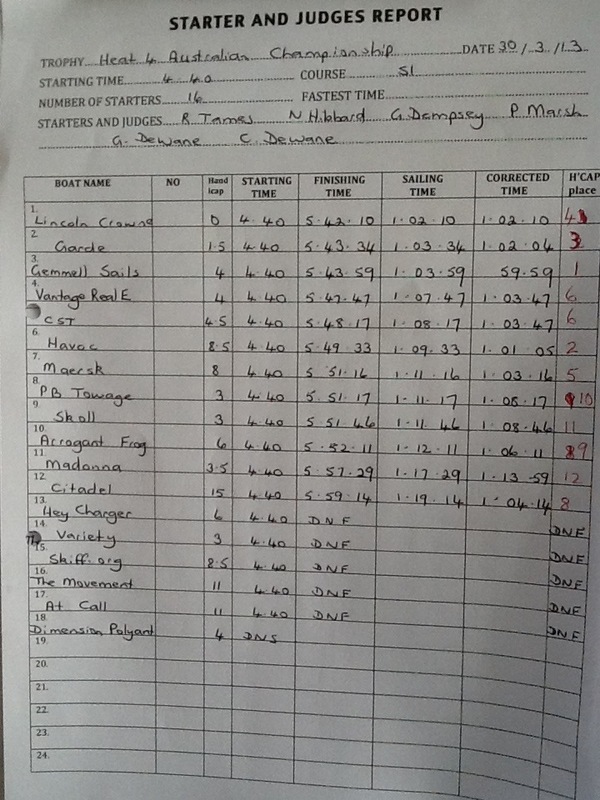 The pair virtually led from start to finish and managed the win despite some late drama caused by gear failure. The win maintains what has been a great start to the season for the veteran crew. A building North East breeze was forecast and had filter up the river to Abbotsford early, with all boats going for the 2nd rig option. Garde (Brett Hobson and Damien Vlotman) managed a blinder of a start to lead the fleet early on in the first work. A few tacks later, Lincoln Crowne hit the lead, with Gemmell Sails (Murray Press and Scott Lanham) pulling into 2nd ahead of Garde. Skoll (Peter Polec and Alan Jackson) and Skiff.org.au (Ben Faulkner & Renn Holland). 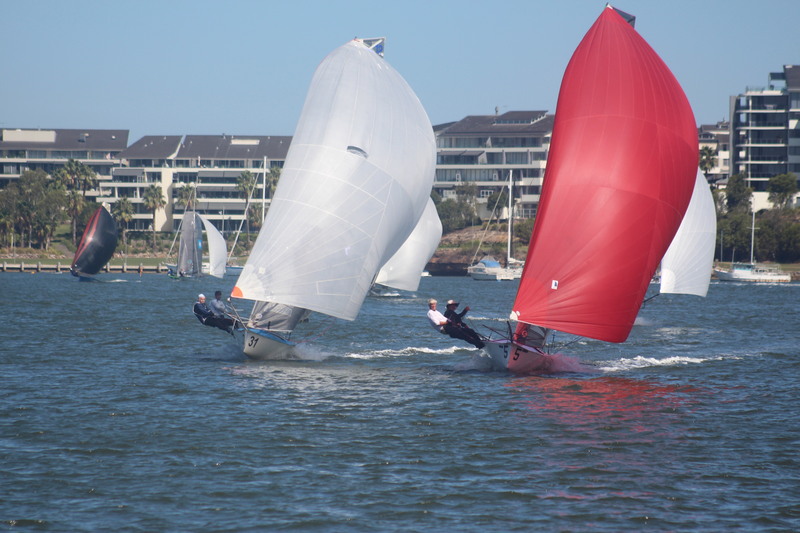 On the tricky river course, Lincoln Crowne had extended their lead by the top mark with Garde just ahead of Gemmell Sails. 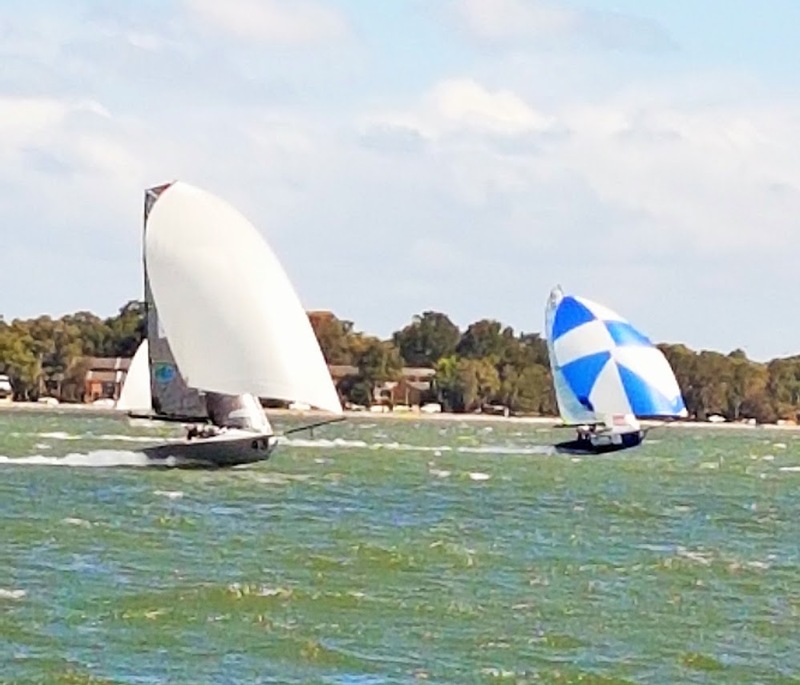 Gemmell Sails and Garde traded places on the downwind run, while Lincoln Crowne were able to extend their lead. 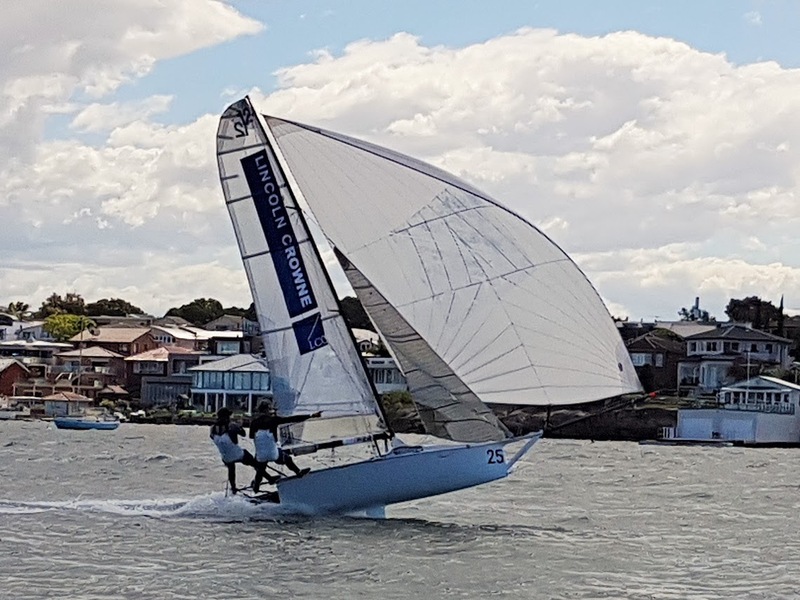 The breeze shifted as it built and this allowed Variety (Adam Forbes & Andrew Stevenson) to briefly catch Garde and Gemmell Sails midway down the run. It look like they were going to take second place before the next crucial gust of wind eluded them. 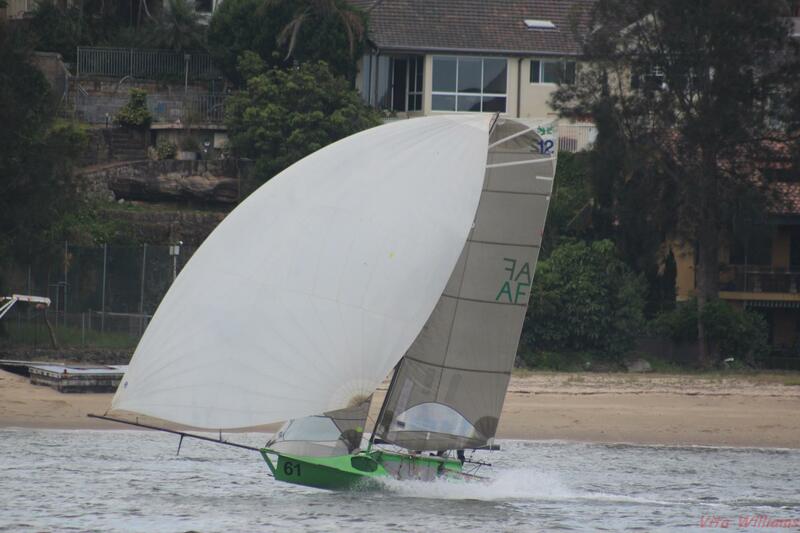 A scrap was emerging behind the leaders with Vantage Real Estate, Skoll, Variety, skiff.org.au and Arrogant Frog trading gybes down wind. Garde extended the gap to Gemmell Sails at the bottom mark but some clever tactical decisions up the next work saw Gemmell Sails move to second. Garde made emends on the downwind to jump away from Gemmell Sails again. Mid race, Lincoln broke their side stay. The rig stayed up thanks to the top stays and lowers, and the crew having to hit the trap at just at the right time. This did allow Garde to close the gap to 1st place , but Lincoln had enough of a lead to stay at the head of the fleet at the finish. 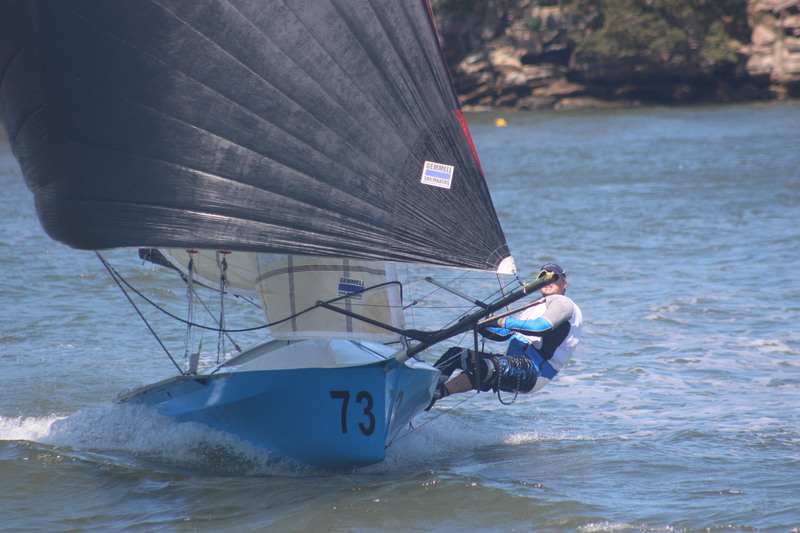 Skiff.org.au had a great day out, maintaining 4th place for most of the race, but unfortunately losing 3 places on the last couple of legs as the breeze continued to build. They picked up the Lenore Dempsey Memorial trophy for 1st on handicap. This entry was posted in Race Reports and tagged Abbotsford on November 4, 2012 by Karmen.